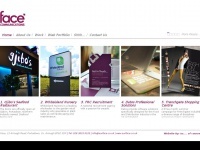 Face Communications is a design agency based in Portadown, offering loads of creative services like branding, design, new media, exhibition graphics, advertising, corporate communications and web solutions. On this web server 29 other websites are hosted. The language of those websites is mostly english. A Apache server hosts the websites of Ourface.co.uk. The website uses the latest markup standard HTML 5. To analyze the visitors, the websites uses the analysis software Google Analytics. The website does not specify details about the inclusion of its content in search engines. For this reason the content will be included by search engines.